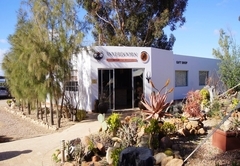 Inverdoorn Game Reserve is a Western Cape game lodge providing a wildlife experience for tourists visiting Breede River Valley. 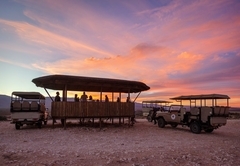 Inverdoorn Game Reserve and Iziba Safari Lodge is located in a malaria-free zone, 2½ hours from Cape Town. It is home to a plethora of wildlife including giraffes, hippos, meerkats, various antelope, over 80 species of birds and the big five. 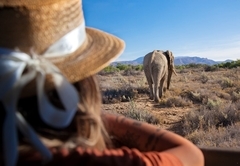 More than 1 200 animals roam free on the reserve, which spans across 10 000 hectares of the Ceres Karoo. 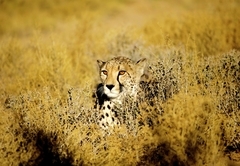 The renowned Western Cape Cheetah Conservation is based at Inverdoorn and offers opportunities to watch cheetah runs and encounter tame cheetah. Guests can choose between day trips and overnight stays and various luxury accommodation options are available for those staying overnight. 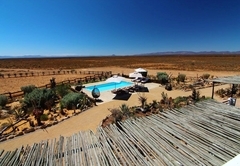 A 5-star luxury suite which can accommodate two guests, it is equipped with a mini-bar, safe, satellite television and a private roof terrace overlooking the vast landscape of the Karoo. 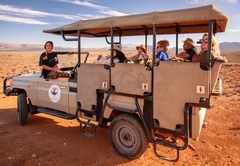 Booking the suite includes an invitation to join our Western Cape Cheetah Conservation team in a cheetah interaction, as well as a private safari. Four, 5-star luxury chalets are available and each accommodates two guests. 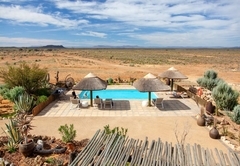 They are equipped with mini-bars, safes, satellite television and communal roof terraces overlooking the Karoo. Booking luxury chalets includes an invitation to join our Western Cape Cheetah Conservation team in a cheetah interaction. Each of the seven, 4-star chalets accommodate two guests. 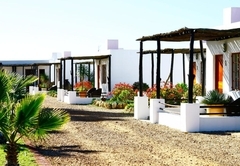 They are equipped with mini-bars, safes and private verandas. 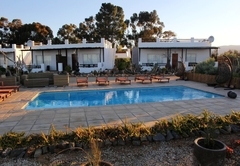 The two guesthouses are ideal for families and large groups. 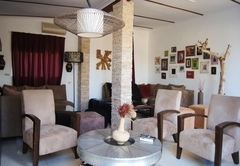 Each guesthouse features a communal lounge with a refreshment station. 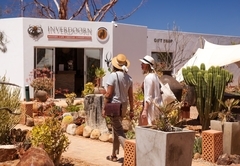 Children are welcome at Inverdoorn; however, no children under the age of 4 are allowed on the safaris and children under the age of 16 are not allowed on cheetah interactions. Cheetah interactions are strictly weather dependent. 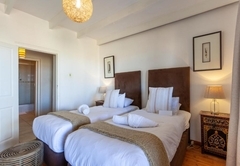 5 stars Luxury Suite - 90m² - mini-bar - safe - air-con - fire place - bath - shower - satellite TV - private roof terrace. Invitation from the WCCC, to join them on a walk with tame cheetahs. 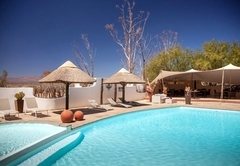 Rates include welcome drink, 2 x Safaris, Lunch, Dinner, Bed & Breakfast. 4 stars - 35² suite, mini-bar, safe, air-conditioning, fire place - shower - private veranda. Rates include welcome drink, 2 x Safaris, Lunch, Dinner, Bed and Breakfast. 5 stars - 45m² - mini-bar - safe - air-con - fire place - bath - shower - satellite TV - private roof terrace. *invitation from the WCCC, to join them on a walk with tame cheetahs. 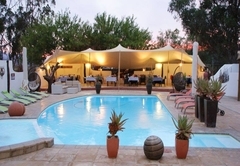 Rates include welcome drink, 2 x Safaris, Lunch, Dinner, Bed and Breakfast. 5 stars - 45m² - mini-bar - safe - air-con - fire place - bath - shower - satellite TV - private roof terrace. *invitation from the WCCC, to join them on a walk with tame cheetahs. 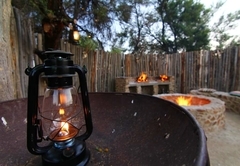 Rates include welcome drink, 2 Safaris, Lunch, Dinner, Bed & Breakfast. 4 stars - 35m² - mini-bar - safe - air-conditioning - fire place - shower - private veranda. 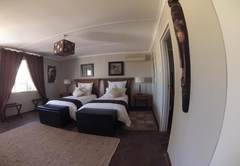 Rates include welcome drink, 2 x Safaris, Lunch, Dinner, Bed and Breakfast. 4 stars - 26m² - air-conditioning - fire place - shower - veranda. Rates include welcome drink, 2 Safaris, Lunch, Dinner, Bed and Breakfast. 3 stars - 40m² - fan - shower - communal living area. 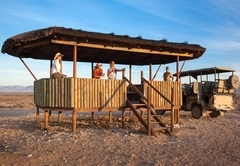 Rates include welcome drink, 2 x Safaris, Lunch, Dinner, Bed and Breakfast. 3 stars - 40m² - fan - shower - communal living area. Rates include welcome drink, 2 Safaris, Lunch, Dinner, Bed and Breakfast. Suitable for 2 adults and 1 child under 12 years only. 3 stars - 2 inter-leading rooms - bath - shower - communal living area. Rates include welcome drink, 2 Safaris, Lunch, Dinner, Bed and Breakfast. 3 star Guest House. One large room with double bed, single bed and double - pullout couch. air-con. shower. Rates include welcome drink, 2 Safaris, Lunch, Dinner, Bed and Breakfast. 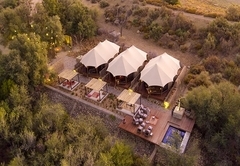 Luxury Tented Camp - 100% Prepayment required. Rates include welcome drink, 2 Safaris, Lunch, Dinner, Bed and Breakfast. 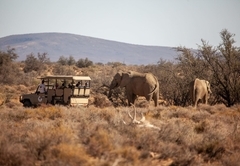 Response timeInverdoorn Game Reserve typically responds to requests in 5-10 minutes.